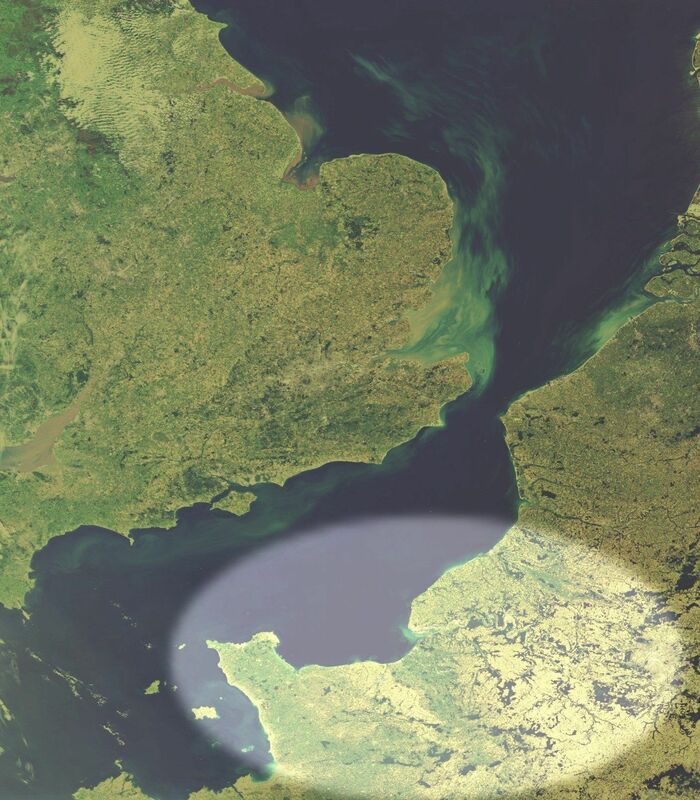 During the Roman period, Normandy was part of Gaul. The Celtic tribes of the region that had arrived in the area somewhere around the 5th century B.C. were conquered by the Roman armies led by Julius Caesar in 56 B.C. He established his capital at Rotomagus, which today is the city of Rouen. The Roman period saw the founding of many other cities throughout Normandy, such as �vreux, Lisieux, Coutances, Lillebonne and many others. The Christian Gospel reached this area probably during the third century. St. Mellon became the first bishop of Rouen in 260 AD. The Romans left towards the end of the fourth century, partly due to the increasing raids of Saxon and Germanic tribes. As a result Normandy became a battle-field for these warring tribes and groups until it was invaded and conquered by the Franks during the fifth century. In 486 the area became part of the Frankish Merovingian empire under King Clovis. It is from the word "Franks" that France derives its name. T hey remained the dominating power until the arrival of the Vikings in the ninth century. The famous Abbey of Mont-St.Michel was founded in 708. Today it is a famous tourist attraction situated towards the border between Normandy and Brittany. During the ninth century the region was repeatedly invaded by the Norse Vikings, the Northmen. The first raids up the Seine valley occurred around 820. It was from the Norse - Norse Men, or Nord Men - that it received its name - Normandy. Hrolf, or Rolf, unsuccessfully beseiged Chartres, but then went on to threaten the Seine valley, and Paris itself, so in 911 the king of the Franks, Charles III (Charles the Simple) officially handed over the region to the Normans through the Treaty of Saint Clair-sur-Epte in 911. By this treaty the Frankish king ceded soverignty of the region approximately equivalent to today's departments of Seine-Maritime and Eure, that is, Upper Normandy (Haute-Normandie). In return, the Viking leader agreed to become a Catholic and to be baptised, and also to prevent further Viking raids up the Seine towards Paris. This Treaty of St Clair-sur-Epte is effectively the foundation of the Norman State. It was originally centered around the town of Rouen on the banks of the Seine. They continued to expand their dominance over other territories, those that today form Lower Normandy (Basse-Normandie), that is, the departments of Calvados, Manche and Orne. By 933 effectively all of the current extent of Normandy was under Viking control, except for a small area in the very north of the region (added in 996: the Pays de Talou) and another small area in the south-west around the town of Domfront (added in 1050). Normandy's borders have varied little since about 933, showing remarkable stability throughout the Middle Ages when borders throughout the whole of Europe were changing dramtically and frequently. The leader of the Vikings, Rollo, was originally known by his Old Norse name of Hrolfr (Rolf). In addition to being known as Rollo, after being baptised into the Catholic church - one of the conditions of the Treaty of St Clair - he became known as Robert I. He became the first Duke of Normandy. However, further attacks by the Normans led to various other parts of what is now the region of Normandy being handed over to the control of Rollo. The Normans soon became Christianised and within two generations of 911 they had adopted much of the Kingdom of the Frank's language, religion, laws, customs, political organisation and methods of warfare, yet at the same time retaining much of their own Scandanavian background. In 1066, William, Duke of Normandy, invaded England and defeated the English king, Harold, at the Battle of Hastings on the south coast of England. He was crowned king i n Westminster Abbey on Christmas Day, 1066, thus inaugurating a period of Norman rule in England that lasted about 100 years. This battle is immortalised in the Bayeux Tapestry, which can be seen displayed in Bayeux, Normandy. In the years 1204 onwards, during the reign of the English King John, Normandy was recaptured from the English crown by Philippe-Auguste, King of France, and the duchy of Normandy was united with the French crown. He was unable to capture the Channel Isles - the Isles Normandes - and they remained part of the English crown territories. The period known as the hundred years war lasted from 1337 to 1453. This was fought between the English and the French, and included famous battles such as the Battles of Crecy and Agincourt, and the capture and burning of Joan of Arc at Rouen in 1431. During the Franco-Prussian war of 1870-1, Upper Normandy was occupied by the invading Prussian armies. The D-Day landings of June 6th 1944, and the ensuing battles that culminated in the defeat of the German armies in Normandy at the Battle of the Falaise Pocket on August 22nd 1944, led to the liberation first of Normandy, then France, and finally the defeat of Nazi Germany in May 1945.